Different types of carbon fibre are used to make the fork: HR, IM and HM in order to obtain the best compromise between stiffness, flexibility and handling, whilst controlling the weight of the fork, which remains below the 500 gm limit. The frontal / lateral stiffness ration has been developed to gain steering accuracy. The fork is offset for an exceptional air penetration coefficient and LOOK has worked on all aspects to have the best aerodynamic sections within the 3:1 ratio imposed by the UCI. 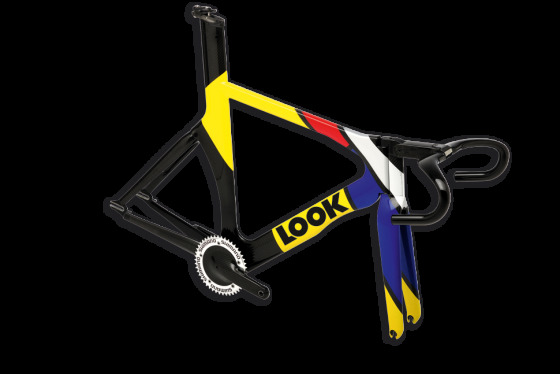 LOOK has also developed a new interface with the stem permitting continuous adjustment without loss of stiffness. LOOK handlebars contributing to improving the bicycle’s global aerodynamics by using profiled sections and an extremely small drop. The stem is thus positioned in the continuation of the flow, specially developed for the track by LOOK, contributes to improving the global aerodynamics of the bicycle using profiled sections and an extremely small drop. The stem is thus positioned close to the horizontal and consequently in the continuation of the flow. The small drop, combined with its innovative shape, allows separation of the forearms, indispensable in the maximum power phases. This bar has been designed to comply with UCI 3:1 standards. Like the crankset, the handlebar is a key part in a track bicycle. With a carefully designed composite LOOK has developed a unique new moulding process. This bar combines all the rigidity of HM fibres, the technical qualities of uni-directional prepregs and high precision moulding. 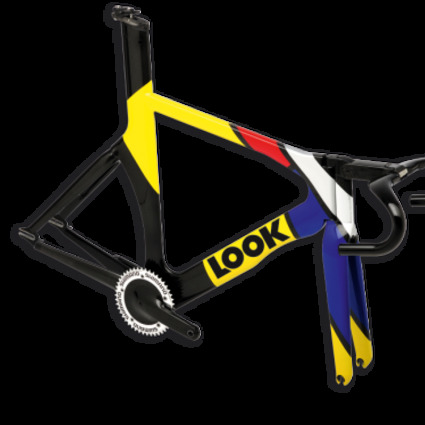 LOOK uses high-pressure compressed carbon technology to optimise the mechanical resistance without losing stiffness. A new system (LOOK patent) permits continuous angular adjustment by friction cone so as to have the finest height adjustment whatever the stem length. The stem cap is completely integrated to conserve the aerodynamic qualities.